Curator Irving Finkel may have joined the wrong department to look after the Lewis Chessmen, but that hasn't stopped him writing a book on them, and having a surprising connection to a film about a certain boy wizard. 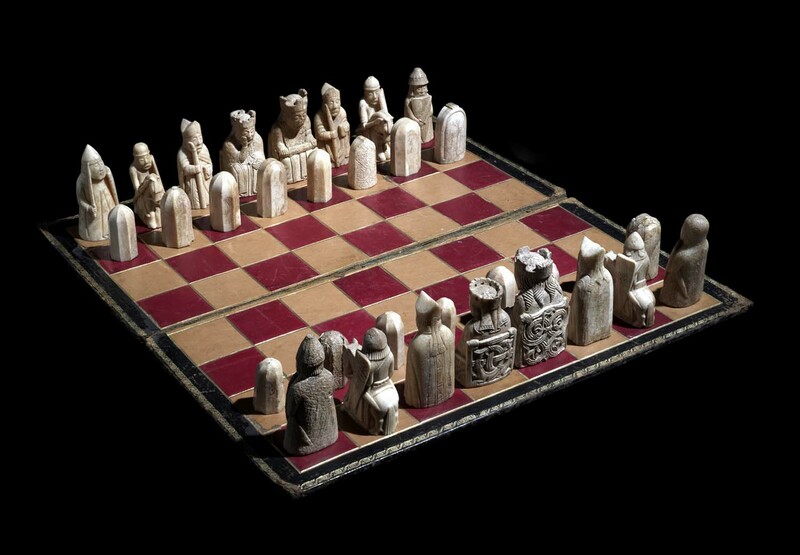 When you look them in the eye you realise that the chessmen from the Isle of Lewis are not just archaeological objects sitting obediently in a museum case like any others. They follow you if you try to look away. There are lots of them, waiting in a zoo-like cage. Bunched together, old and experienced, they seem anxious to be off into the fresh air, although they seem glad to be looked at, and fond of staring children down. 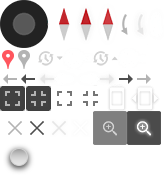 Everyone who sees them wants to pick them up, and examine them, and try a game with them. Their job, of course, was to do battle. They are early chessmen for a board game that had originated far across the world in ancient India where local chessmen were very different-looking. The Lewis pieces, skilfully carved out of walrus tusks somewhere in Scandinavia, are designed for life in Britain in the 12th century. Indian chariots and camels disappear and warders (rooks) on guard and bishops take their place, and no one could ever mistake the kings (stately) or queens (worried). They were found in around 1831 on one of the world’s truly beautiful beaches, silver sand and sparkling sea, on the north side of the Isle of Lewis in the Outer Hebrides. Curators have sometimes been back there looking for more chessmen, but so far have had no luck. And if you go, that water is cold beyond words, so no jumping in. The pieces had various adventures in the 19th century before they ended up in museums, where they certainly belong. Some are in Edinburgh, the remainder here in the British Museum, although recently a small party of the chessmen has gone back to the Isle of Lewis on a long-term visit, to preside over the exhibits in the Stornoway Museum and delight locals and visitors alike. Many years ago I wrote a small story book about the Lewis Chessmen. Clive Hodgson drew the pictures and Roderick Maclean translated the whole thing into Gaelic. When it was published I went to the Stornoway Museum with Roderick and we read the story out loud half in English, half in Gaelic, while children from all over the island sat around us in a ring. I remember asking one of the teachers how she had managed to choose the three children that she had brought to the reading from the other children. Weren’t the others cross? I asked. No, she said, I brought the whole school with me. That’s all there are! There is nothing like the Lewis Chessmen. Once there was a television programme when the public had to vote on the top ten exhibits. Everyone expected the usual gold things to win, but no! The Lewis Chessmen were securely within the top five. And rightly so. Have a look for yourself. Take a closer look at the Lewis Chessmen in our Object in focus blog. Explore the Lewis Chessmen range on the online shop. You can see some of the Lewis Chessmen on display in Room 40. 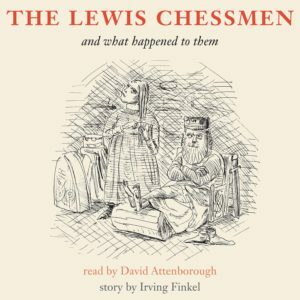 An audio CD of Irving’s book The Lewis Chessmen and what happened to them, read by none other than David Attenborough is available to buy from the British Museum shop.